We had quite the turn out! In the back row we have my Aerie, di-chan123’s Yami piggybacking on her custom Haruhi, jun97’s Ryoko who is visiting T-Rho, PlasticFantastic’s Asuka and nkei’s new Beatrice. 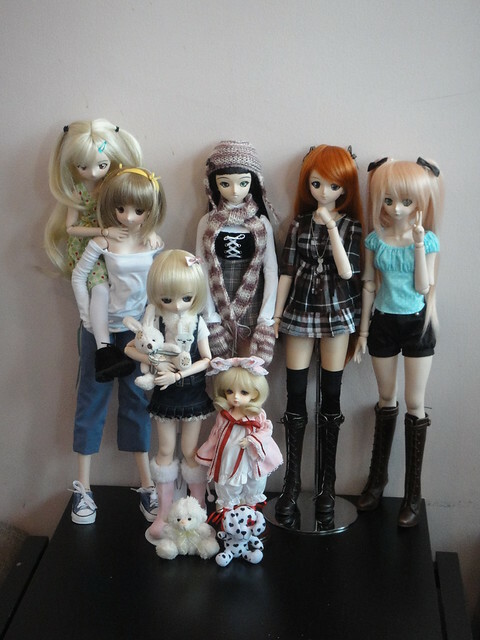 In the middle row is PF’s Madeleine (Maddy), my Médée, Gabrielle and PF’s Yoko; and in the front row is PF’s Elle hugging Machiko’s Lareine, juu-yuki’s Airi (Rina), Machiko’s Delilah, and kai-suteki’s custom girl Tai. 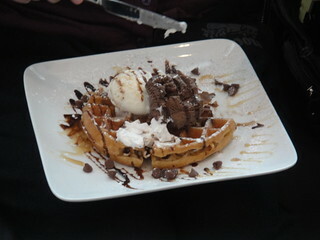 This time the Red Velvet cake and waffles were very popular! (Obligatory food pics for LittleBearries! 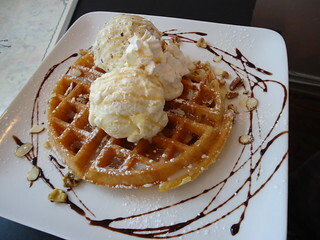 ^__^”) These are the Chocolate chip waffle and the Nuts Waffle. When it was just a few girls, you could see how cleverly di-chan123 had posed Yami and Haruhi and they are so adorable! 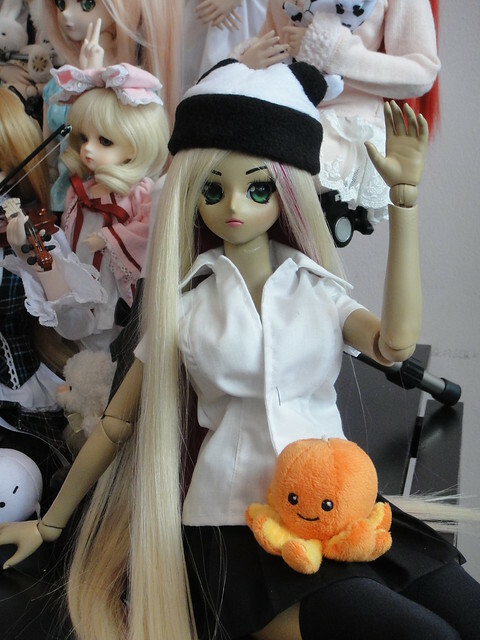 Delilah is dressed up as Hina Ichigo and looks so cute that even Médée is checking her out! 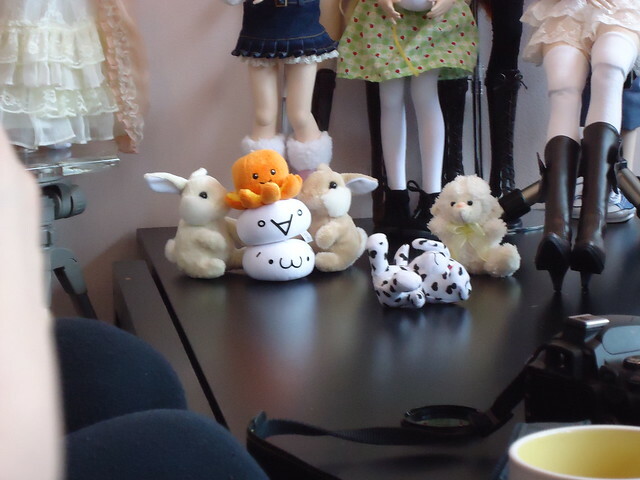 Here’s PlasticFantastic’s pretty Elle with Machiko’s Lareine dressed up in a cute sheep outfit from Volks. 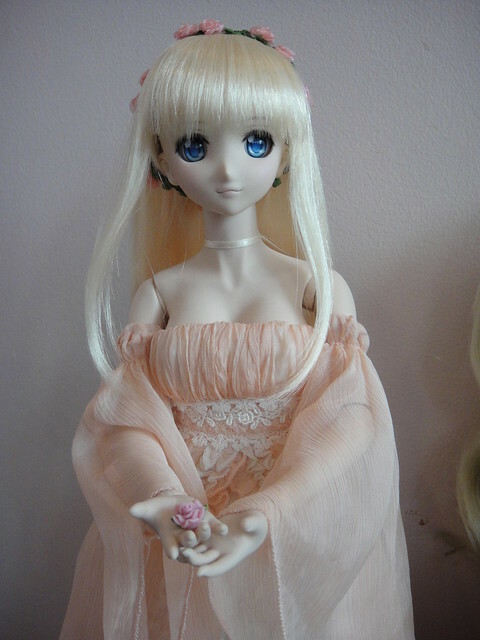 Here’s juu-yuki’s lovely Airi, a Rina that she gave a new face-up and custom eyes. nkei recently acquired a Beatrice head, but she didn’t have a wig or outfit for her yet, so PF and I brought a few random things for her to wear so that poor Beato wouldn’t be naked! Here she is in a really nice cotton halter dress (it looks great on S, M, L and DDdy busts!) 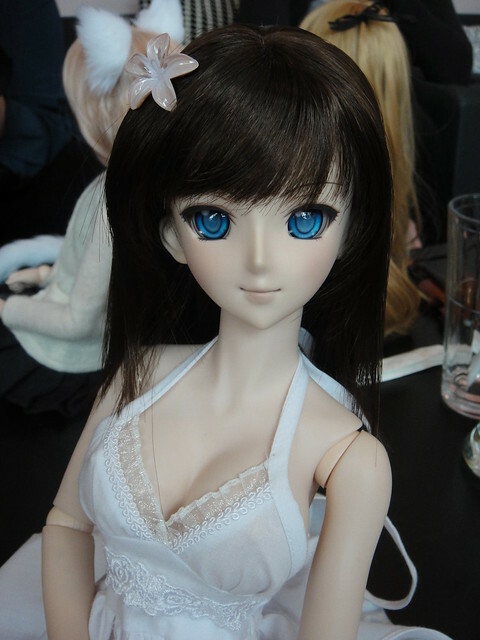 and Moe’s “Alternate” wig from Volks. I ordered mine through DollfieWorld ages ago and they arrived back in December, but I didn’t realize that people that ordered their Moe & Natsuki wigs from VolksUSA are still waiting on them! Yikes! It is a very nice wig though – there’s a “skin-top” piece at the scalp (like nice-quality human wigs have) and it’s really soft. 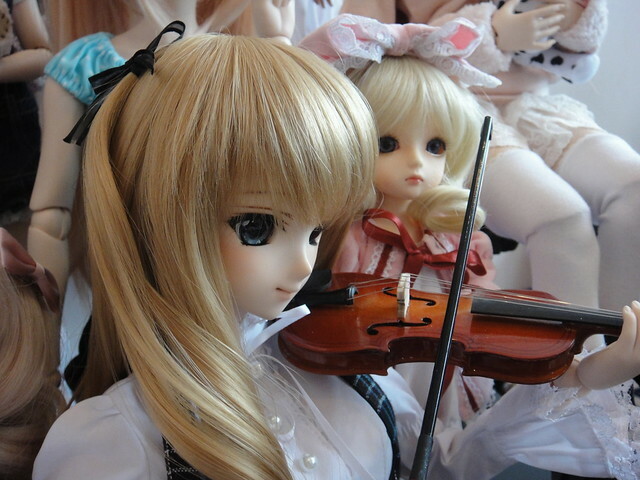 I think I want a Beato now… she’s so pretty! Now Beatrice’s arms have more posing ability and she can touch her face! In the meantime Airi and Asuka started talking about each others hobbies. At one point, Airi even let Asuka try playing the violin. Aerie is in her Springtime Faerie dress and looks ready to sprinkle everyone with flowers. I was curious to chat with kai-suteki about her custom DD since she gave the whole body a “spray tan!” LOL It was a lot of trial and error, and kai still has some more mods to do but I think she’s looking really cool. I can’t believe how much work she’s put into the doll – she even made the pink and blonde wig from scratch! It’s too bad you can’t see all the cool ear piercings that she has in this photo. Never leave little plushies unsupervised – they get into all kinds of mischief! 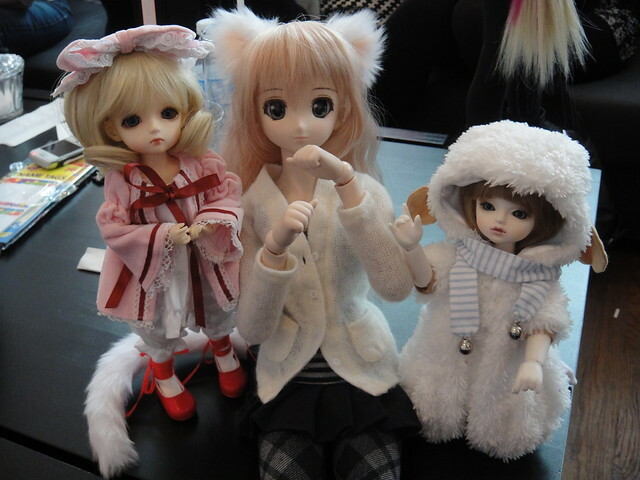 PlasticFantastic’s Madeleine (DDH-06 custom) with Machiko’s Delilah and Lareine, the only 2 resin kids at this month’s meetup. Maddy is teaching them how to properly make “nyan-nyan” kitty hands, but the little ones aren’t quite getting the hang of it. 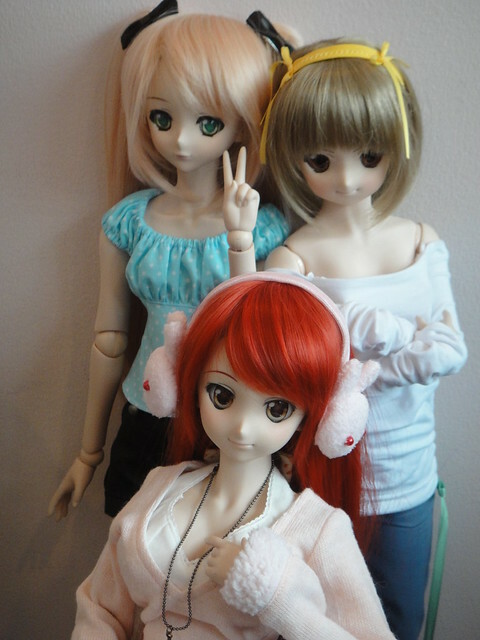 Here’s my Gabrielle with di-chan123’s custom Haruhi and PlasticFantastic’s Yoko. Gabrielle is sporting a cute new top from puppy52 and it looks so cute on her! One thing about this meetup that was nice, is that since we’re getting more comfortable with each other, we don’t mind of other people handle our dolls and move them around. Last month the dolls pretty much stayed in their corner behind an invisible force field or something, but this meet it was nice that the dolls were moved around a bit – it made for lots of nice pics! Thanks to everyone for coming out for another fun meet-up! Looking forward to our next gathering at High Park to take pictures with the sakura trees! This entry was posted in Doll Meetup, Dollfie Dream and tagged Aerie, Dollfie Dream, Gabrielle, meetup, Toronto by archangeli. Bookmark the permalink.